The US barrier film market is forecast to rise 4.2% per annum to $5.7 billion in 2021. Growth will be driven by an ongoing shift from rigid to flexible food packaging. Medical products and pharmaceuticals will grow at a strong pace due to increased healthcare spending and new drug formulations requiring higher barrier packaging. The fastest growing resins through 2021, EVOH & PET, will strike a balance between cost and high performance. 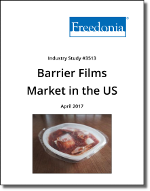 This Freedonia industry study analyzes the US barrier film market. It presents historical demand data plus forecasts for 2021 by barrier film type (oxygen and other gas, moisture, corrosion), market (electronics, food packaging, pharmaceutical and medical products, construction, primary metal products, agriculture), and resin (polyethylene, polypropylene, polyester, PVC, nylon, PVDC, EVOH). The study also evaluates company market share and analyzes industry competitors including Bemis, Berry Global, Charter NEX, DuPont, Printpack, Sealed Air, and Toray.